For the first event of 2018, we partnered with the San Jose Museum of Art Young Professionals’ group, SJMA. Together we brought together 100 YP’s here in the Silicon Valley and enjoyed an epic night at the San Jose Improv. If you have not yet been to this venue, you are missing out on a historic hidden gem here in Downtown San Jose. Countless famous comedians have all performed here! The night kicked off with some networking, then we brought Steve Cadigan to the stage. He is the former VP of Talent at LinkedIn, Co-Founder of ISDI Digital University and the Head of Digital Transformation. The first institution to offer a Masters in Internet Business & Digital Marketing. Steve is a icon and industry leader here in the Valley. He has witnessed, optimized and transformed several businesses and company cultures all around the world. He spoke to our young professionals’ about “Careers in the Digital Age” and how the digital age has changed the way people think about jobs and look for jobs. He also touched on the current digital skills gap many companies are challenged with. It is important that the millennials of today do what they can position and prepare themselves to prosper in this digital age. After the seminar everyone got to enjoy drinks, appetizers and stay for the comedy show! This month’s event was the highlight of the year and record breaking for sv next. Not only did we have over 150+ people in attendance, but this was also the start of sv next’s very first partnership with the San Jose Museum of Art. Thank you to the San Jose Museum of Art for opening up their beautiful space for our young professionals to come together for a night of fun! With food from Curry Roots, Maggiano’s, Scott’s Seafood and Blush Sushi, we were spoiled all night long. Thank you again to all our food sponsors for your generous donations. From checking out all the exhibits, to the photo booth, to dancing and all the cocktail attire. The Museum was filled with Holiday Spirit. Stay tuned for next year round 2 ... ! Well, we invited experts in the industry to come and shed their wisdom on our young professionals. We had Rachel and TJ Martin from North First Mortgage, an independently owned mortgage brokerage and along-side them we had Cristina Mendoza & Amparo Mendoza – Patino from Intero Real Estate. Several millennials working here in The Silicon Valley ask themselves if they could ever possibly afford a home here someday. They wonder if they should they consider moving when that time comes? As a team they addressed how to save, first steps, pricing, covered examples of different properties, renting vs. buying and all vocabulary one might ever need to know! They covered the entire journey from start to finish on how to buy your first home. Thank you Rachel, TJ, Cristina & Amparo for giving back to sv next and contributing to more informed and prepared millennials. Sv next decided to take on Halloween with one of our favorite neighbors, Scott’s Seafood here in downtown! As many of you may already know, they are famous for their breathtaking rooftop patio & have hosted endless memorable events up there. From corporate parties, to wedding receptions to young professionals’ mixer like ours, they are quite the hosts. With over 60+ people in attendance, everyone enjoyed an intimate night of networking, a gorgeous view of San Jose and Halloween sprit in the air! 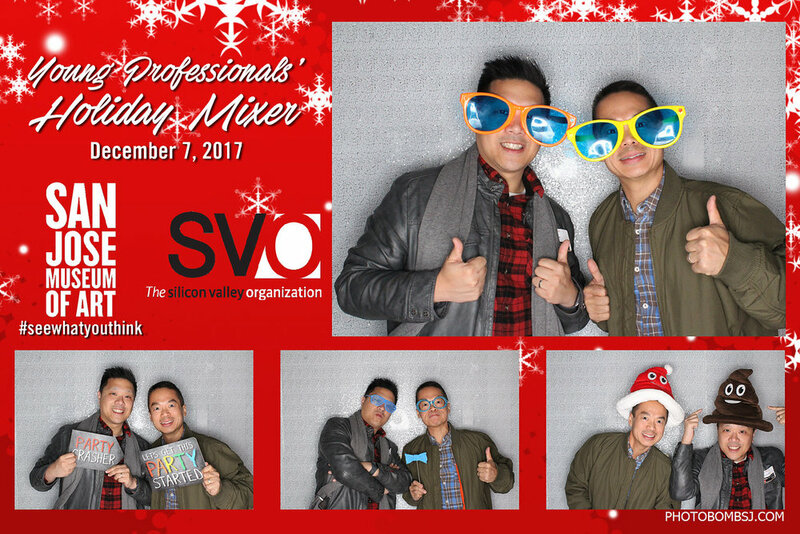 Another sv next networking mixer for the books. Christmas in the Park invited our young professionals group, sv next to come revamp and clean all of their displays before moving into the park on October 26. Our group got a special behind the scenes VIP tour of the Christmas in the Park Warehouse from the Executive Director, Jason Minsky. We got to see where all the magic happens. From dusting, to painting, to fixing, our group executed the task all in hopes of prepping for San Jose’s favorite time of year. This was a special opportunity for our group, especially for those who have a special place in their heart for San Jose. They are always looking for volunteers to help them, so never hesitate to reach out. It truly takes a village to bring Christmas in the Park to life! Millennials want to work, play, stay fit AND be healthy all at the same time! How do they find the time to stay conscious about every single thing they put in their mouth throughout the midst of their busy schedules? These simple choice matter now. Our health is forever. Our guest speaker Michelle Sugiyama, a certified health coach, national speaker and nutritional chef came speak to sv next about making better nutritional choices. She is passionate about helping employees, families and individuals achieve their wellness goals. Her mission is to help bridge the gap between knowing you should be healthy and actually doing it! She caught all the millennials up to speed with the latest nutritional findings, trends and meals. To add some more flavor to the evening, Michelle did a little cooking demo for the group and they got to try samples from a brand new organic cold pressed juicing company called JuiceAlize. With well over 30+ people in attendance we had lots of intimate networking and plenty of new faces. Thank you Century Towers for hosting us in your hip new clubhouse and thank you Michelle Sugiyama for sharing. Check out her company- Mindful Eating. Ever wondered what goes on behind the scenes in the Human Resources Department when it comes to resumes and the recruiting process? Well worry no more! We had guest speakers Tammy Nguyen, Talent Acquisition Manager and Becky Saldivar the Director of Compensation & Benefits from California Water Service come and speak to sv next about the job process. Together these ladies tagged teamed and took the group through the race of landing a job, start to finish. They touched based on everything from resumes, to interviewing, to receiving a job offer and ended with evaluating a compensation and benefits package. There is so much that can be overlooked when looking at the entirety of a job offer. Often times there is a lot of fine print that isn’t brought to our attention when it comes to compensation and benefits items that these ladies don’t want millennials to miss out on. With 35+ people in attendance, the group fired question after question to these ladies getting all the insider’s tips possible. Thank you Foundry Commons for providing such a fun atmosphere for the group to network & enjoy the seminar portion! Well done presentation from our speakers, thank you spending time with sv next! Did you know that 75% of millennials said that their finances worries them? Well sv next did something about it and brought in Kelly Tucker, an established Financial Advisor from Morgan Stanley. More than 45 young professionals gathered together at J.Lohr winery’s tasting room here in Downtown San Jose to tune in on Kelly’s financial tips and tricks. All the questions were submitted and every answer was unlocked throughout the night. Entering the working world, college left many millennials will no basic knowledge of 401k’s, Roth IRA’s, loans, building credit, saving, budgeting or bonds. You name it, Kelly was there to ease their worries as we all sipped on wine and ate cheese. Thank you Kelly and thank you to J.Lohr for being such generous hosts! Sv next had a special visit from one of The SVO’s very own Board Members, Rick Angelini. Rick is also the owner of Cosmopolitan Catering. He is very passionate about networking and wanted to give back to the millennial executives of Silicon Valley. Our young professionals were up bright and early for the intimate opportunity to learn about the mindset Rick had that translated his actions into the success he has today. He strongly emphasized his strategy: Give more than you take. "Forget what is on your business card and brand yourself first." Thank you Rick for sharing all your networking tips with our young professionals! They were all a huge fan of you! 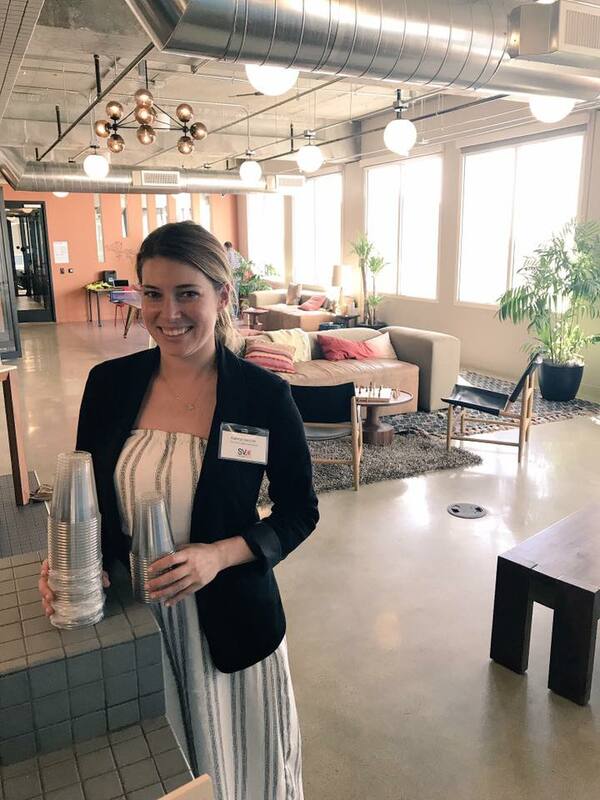 May 9 took place at the most inspiring, up-and-coming company on the block: the WeWork Valley Towers! We were so thrilled to have WeWork host out May Mixer & Seminar. That evening our young professionals were submerged in learning all about the startup culture here in the Silicon Valley. We were lucky enough to have three incredible panelists that have all see their dreams come to fruition. Each of them shared their personal story of how they brought their company to life. We had the chance to hear all about their failures, their challenges, how they overcame them & all the success they have witnessed so far. With start-ups being the present and the future of the Silicon Valley, this is exactly what sv next needed. It is with great pleasure to say we had over 50+ people in attendance, we live streamed the event on our Facebook page and our audience asked some great questions. Thank you to our panelists for the inspiring night and thank you WeWork for being such fantastic hosts! “The Loft” is their new boutique that features all their antique, stylish, hipster clothing and collectibles. All for a very affordable price. 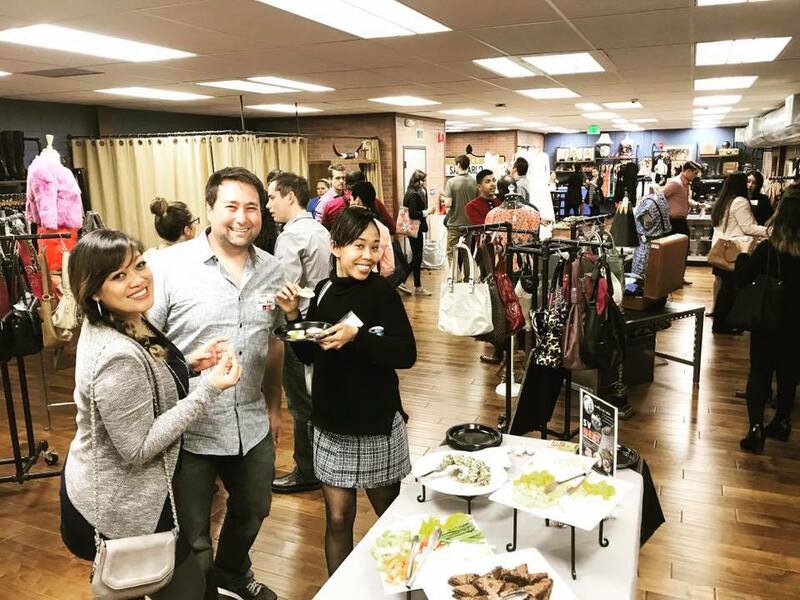 With over 40+ millennials in attendance, Goodwill had drinks, appetizers and let sv next shop in The Loft for 20% off. It was a new feel for the group to conquer a mixer at a local store and without a doubt the group didn’t disappoint! We even had some attendees bring in donations to Goodwill. We had a great group come to support this non-profit and bring life to the store. P.S. Goodwill made about $300 dollars in sales from our group! Thank you for being such great hosts Goodwill! Bowlero took sv next through a serious V.I.P experience in their private bowling room! They had such an artsy, fun, energetic set up that left the group in awe. Five private lanes for the group, staff serving hot snacks throughout the evening, drink tickets for the bar, candy table, free bowling passes and game cards for the group to enjoy. All for the cost of $10 to attend. Their generosity kept the mixer alive and happening that evening with new faces and over 35 people in attendance. It was the perfect opportunity for the group to grow their professional relationships while having a good time with one another! If you are a young professional in the valley looking to grown your personal networks in a fun way, come to our mixers. We can’t thank Bowlero enough for hosting our March event, such a fun venue for millennials in the Silicon Valley to enjoy. Book your next event with Bowlero! Corporate, family … they can make anything happen! Sv next partnered up with Cityteam, a member of The SVO. Cityteam is a non-profit that employs many compassionate people working very hard to help those most in need in our community. We had two different groups visit Cityteam to serve in their Kitchen/Dining Room. Many came straight from work and were still in their professional clothing ready to serve dinner to men, women and children living in poverty here in the Silicon Valley. People living on the streets are not accustomed to making eye contact with people, especially young professionals. Many feel forgotten and ignored, but our group had the opportunity to give these people a warm smile and serve a hot meal to then, it was a very touching experience and left many of our young professionals wanting to serve again. Cityteam knows the most important thing is to raise the level of hope for each of those people’s lives. It often starts with a warm meal and a welcoming smile. “Men in our program come from a broad background, some even have professional experience like that of sv next members. Or, they have aspirations to be professionals themselves after completing our program. These men, especially the younger ones, view the sv next professionals as role models. It leaves a lasting impression when they see young business leaders humbly serve a meal to those in need. There is an enormous need in our community and endless opportunities for each of us to make a difference in the lives of our poorest neighbors. Anyone interested in learning more about partnering with Cityteam here. It was time to kick off sv next 2017! We packed the house and gathered around with a flight of beers provided by Taps Takeover. This marked the second year of sv next, a young professionals program put on by The silicon valley organization for millennial executives between the ages of 21-39 years old. This was the perfect time for everyone to reconnect since the last sv next event and kick off the New Year together. Sammy G’s has the most unique pizza in town and always has something going on during the week, Trivia Thursday’s, Wine Wednesday. Check them out, they are right across the street from San Jose State! Stay tuned, sv next has events every month and each event is different. We bounce around from mixers to professional development seminars to community service opportunities.